Nothing new in this post... just seems ever few weeks/months you talk to someone that wasn't aware you could do this. The last person I spoke to had a hard time finding this so I'm posting it for their, and now your, edification. 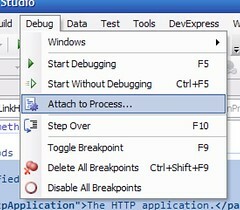 That takes no fewer than 4 mouse clicks (VS Debug Menu | attach to process... | select aspnet_wp.exe/w3wp.exe | click OK). I'm not much of a mouse guy... much prefer shortcuts with my keyboard. The less I have to take my hands off the keyboard while working on a project, the more productive I can be. Not to mention, you could do this many times in the course of working on a project... say you jump into the debugger once every three minutes. On my relatively new laptop, that takes about 6 seconds. Over the course of a day, that adds up (for those few souls who actually work 8hrs a day, that's just under 3 minutes a day). OK, so it's not THAT much of an impact... but it's a repetitive process... can't that be automated? How do you get around this annoying use of the mouse? Give your module a name, I used VSDebugger. Right-click your new module, in my case VSDebugger, and select New macro. Change the name of the macro to something that makes more sense; I used AttachToASPNETWP.
' 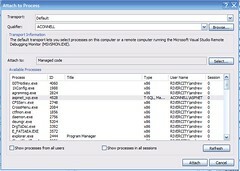 This routine attaches to the ASP.NET worker processSub AttachToASPNETWP() Dim attached AsBoolean = False Dim proc As EnvDTE.Process Dim processToAttachTo AsString ' name of the process to attach to processToAttachTo = "aspnet_wp.exe"
In Visual Studio, open the Options dialog (Tools | Options). Select the Keyboard node under the Environment category. In the Show commands containing: textbox, enter VSDebugger (or the name you chose for your module) to find the command in the listbox. To digress for a second... why in the world did the VS IDE develoeprs (1) give us 10,000 items in such a small listbox (only see 5 items at a time) and/or (2) not make the Options dialog resizeable? Man, that seems so obvious to fix. Repeat the same process to create a shortcut to detach from the process. In this case, search for detachall... I used the key combination CRTL+SHIFT+P, D (so A attaches, D detaches). Now you're good to go! After building your solution (CTRL+SHIFT+B), hit your key combination to attach to the process. [Update 5/10/2006 2:20p EDT]: Technically you CAN debug Web Parts by simply hitting F5, but you have some extra config work to do in Visual Studio and SharePoint. Thanks to Maurice for pointing this out.